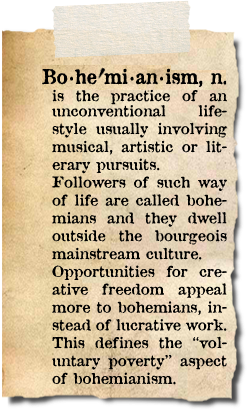 Here's another BuhayBohemio bling. These are actually components of a fashion accessory I found in a not-so-popular department store. So I'm reselling them as dread cuffs. 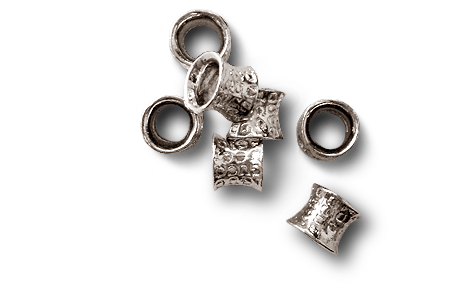 It has an inside diameter of 9 mm and has engraved letters that continuously spell "GUCCI". I think it's plated brass. 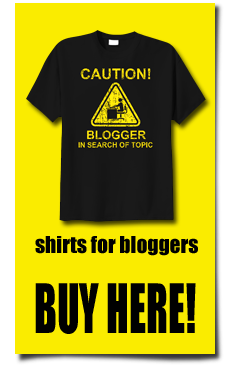 So to prevent it from tarnishing quickly, I advise that it be worn occasionally. 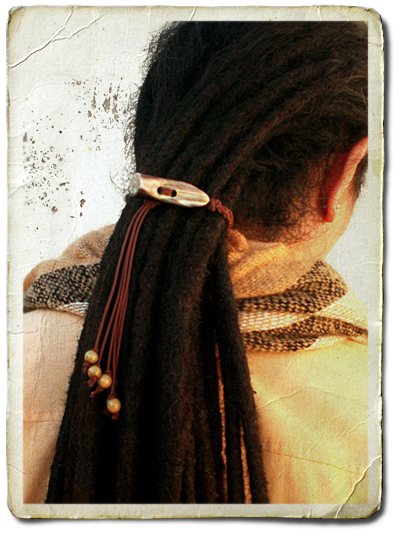 It should not be permanently placed on the locks and should be removed when washing the dreads. 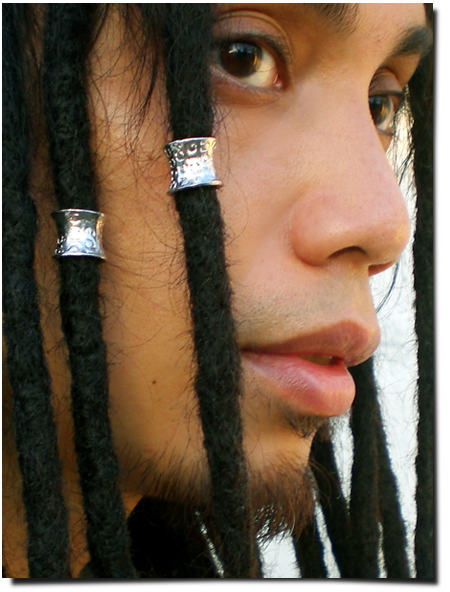 So this new bling is for my fellow dread-heads. I call this my "ox horn" dread tie. 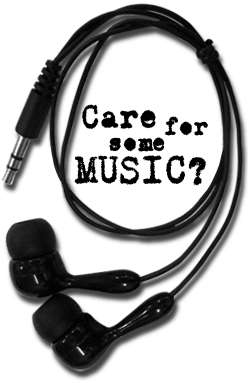 It's made of elastic chord with a horn toggle lock and beads. Now i'm not really sure if it's made of real horn. It could be made of resin. The very fact that I couldn't determine if it's real means that it looks convincing enough. 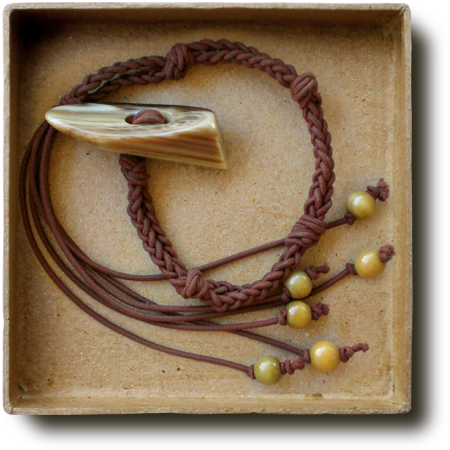 I only made 4 pieces of this dread tie (I'm keeping one for myself), and I'm not sure if I would be able to produce more in the future because I don't know where to get more of these ox horn toggles. I got them from an old coat that was on sale in an ukay-ukay store. 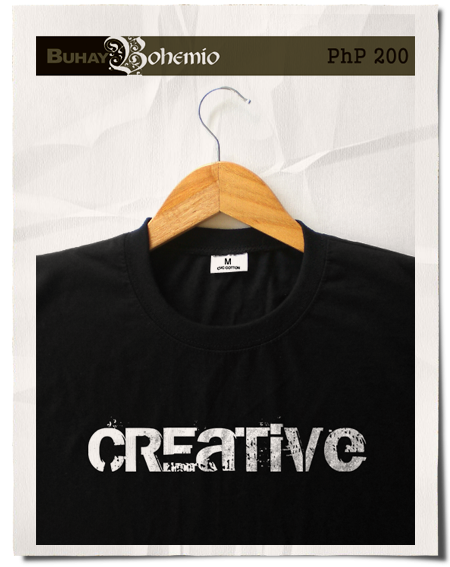 The sheer simplicity of a black shirt with a printed white word has its own appeal. 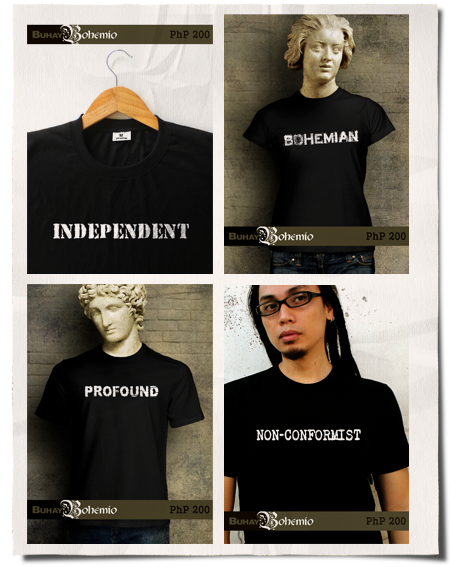 So I came up with 6 shirts, for both men and women, with words that describe unconventional people. 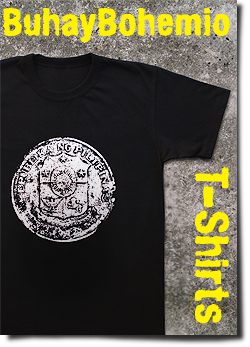 These shirts can also be available in different shirt and print colors. If you guys want one of these shirts inquire here. I was at the Zonta Carnivale Bazaar held at the newly opened Filinvest Tent here in Alabang. 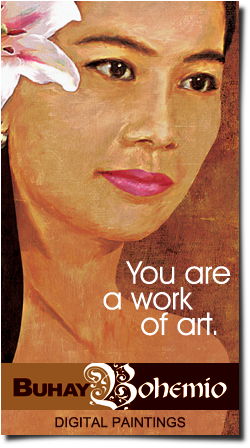 I met a client there to deliver two digital portraits (hmm... it has been a while since I've shared digital paintings here). 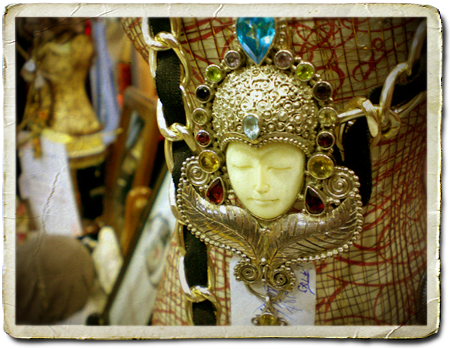 Anyway, since I was at the bazaar, might as well check out the stuff in there. 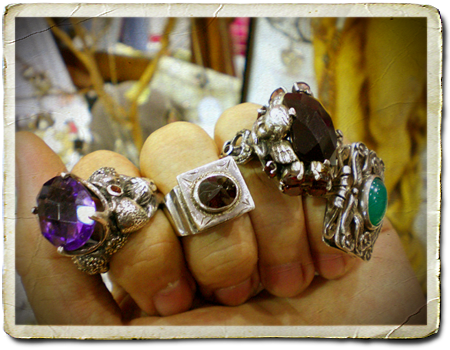 Pretty cool, I should say, with items that you would't find in a typical bazaar or tiangge. After all it was a "soshal" kind of fair held in a pristine air-conditioned tent. There were performances too. But it was just a 2-day event. Maybe the tent will hold a new bazaar next weekend. 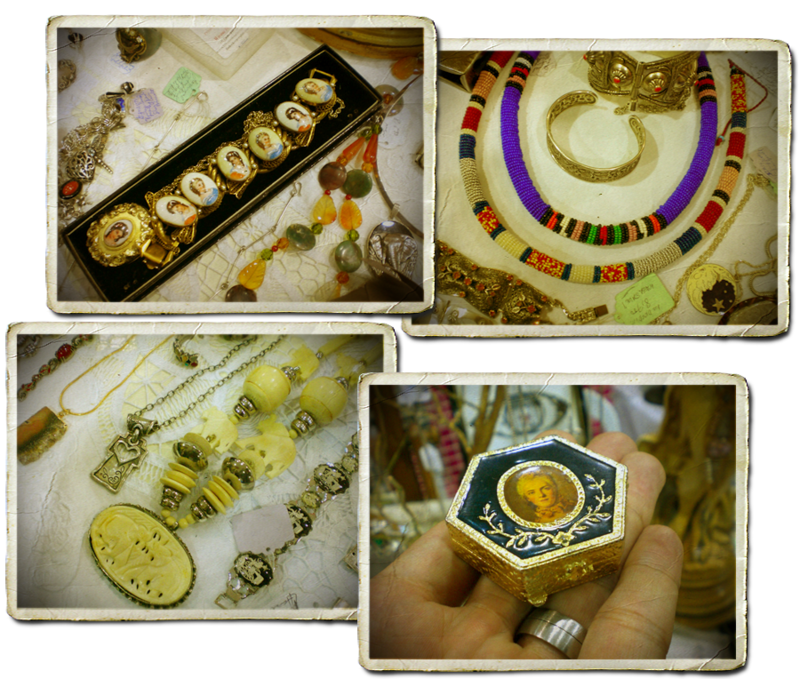 I found a lot of interesting items there but one booth got most of my attention - on two simple tables draped with white cloth is a clutter of an awesome collection of vintage jewelry from Finders Keepers. And behind them is a sweet lady, Wivina Teodoro who told me a little kwento about some of the pieces - what they're made of, where they're from. 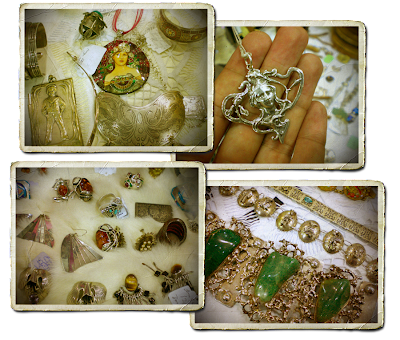 A number of pieces are authentically from the Art Deco period (1920's to 1940's), from different places in the world. Her little stall is like a mini jewelry museum! It's a night of jewelry appreciation for me and it's really nice of her to let me try on some bracelets and rings (even if this poor bohemian guy couldn't afford them LOL). Ahh I'm so reminded of my jewelry designing days. 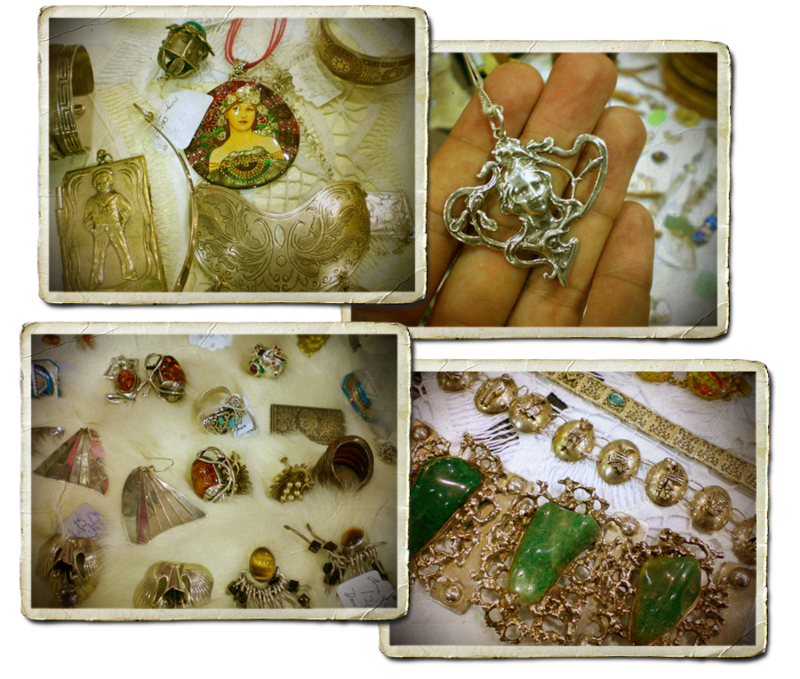 If you would like to buy any of the vintage pieces shown here, or would like to see more of them visit finderskeepersphil.com. Like their facebook page too! I sooo love this song by Coldplay. It's one of the band's recent hits. I love the video too - the animated graffiti, paint splashes and all! I'm not sure how long this flavor has been sitting in their racks. I've been ignoring this cake because it looks pretty ordinary. 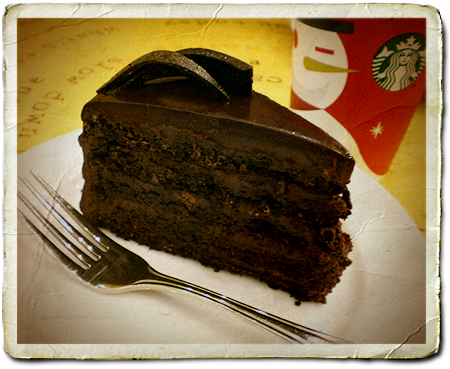 I thought it's just another chocolate flavored sponge cake. But just recently my folks celebrated my niece's 4th birthday and we had this cake. So I'm now giving my thumbs up for this piece of heaven. It has dark chocolate, is sugar-free, made with oat flour and has oat flakes. A slice is quite filling. Try it! 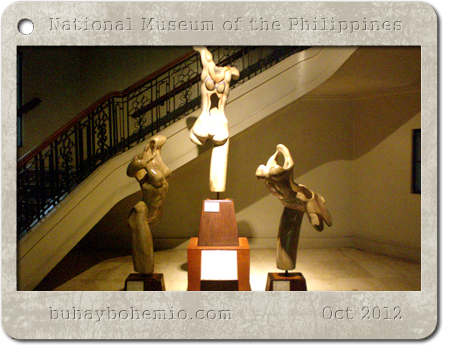 I almost forgot to post about my second visit to the National Museum. 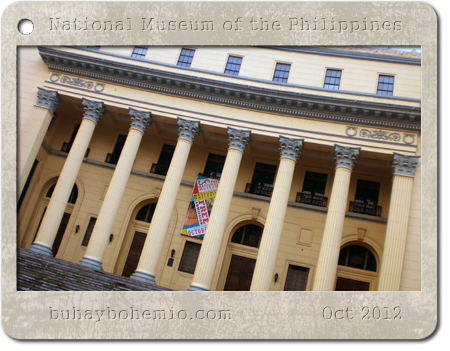 It was the National Art Gallery (Old Legislative Building) that I visited in my last post about the museum. 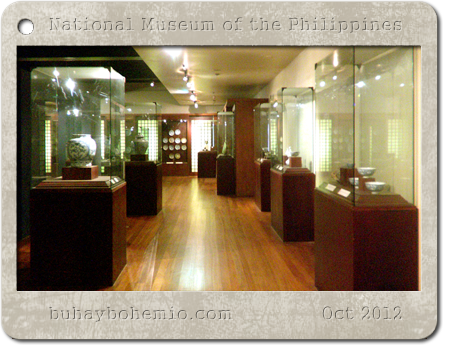 I went to see the Museum of the Filipino People (Old Finance Building) in October 30, 2012, the day before the last day of free admission. Now the admission fee is PhP 150 for adults and PhP 50 for students. 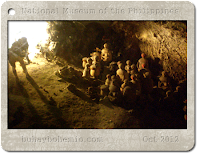 Discounts are available for group tours. 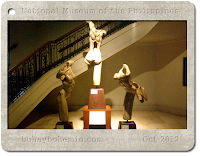 So the first artwork you will find there is this set of sculptures by the stairs done by Jerusalino Araos, one of the most accomplished Filipino landscape artist and sculptor. The first gallery you are most likely to step into is one of the three galleries of the sunken 16th Century galleon, the San Diego. 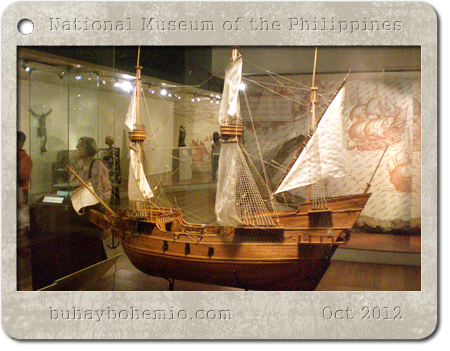 It was built in 1590 in Cebu by Basque, Chinese and Filipino ship builders. Originally a trade ship, it was converted into a warship and was sunk by a Dutch warship in 1600. 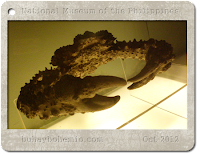 What's left of the shipwreck is still in the waters near Fortune Island in Nasugbu, Batangas. Artifacts from the shipwreck that are being displayed include the cannons, the anchor that looks more like a tree trunk because of corrosion, and a lot of smaller stuff, like a Spanish helmet, an ivory rosary, and these silver coins. The San Diego has a lot of are these terracotta vessels. 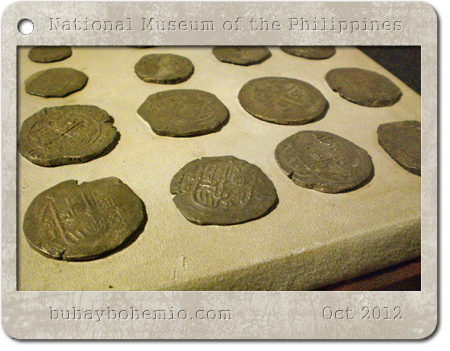 The museum should sell some of these to antique dealers hehe. There's also a lot of Chinese blue and white porcelain. Enough to fill more than one cupboard! 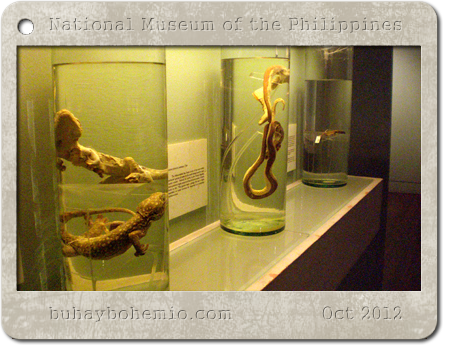 There's a small gallery that display a few preserved plants and animals. I though it might be best if they joined here the taxidermied animals and skeletons found in the other building. Tree nymph butterflies and these locusts are the only insects in this gallery. I think this crab looks cool. A horrid elbow crab. A live one has colors that mimic coral or stone. 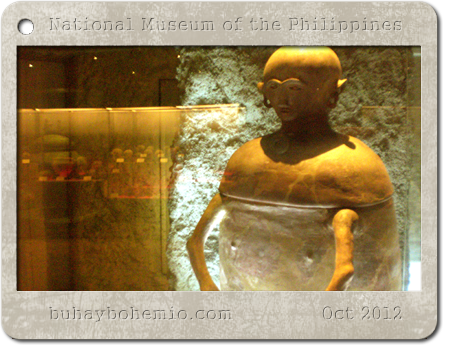 One of the galleries that I find interesting is the one that display the anthropomorphic burial jars that were found in Ayub Cave in Maitum, South Cotabato. 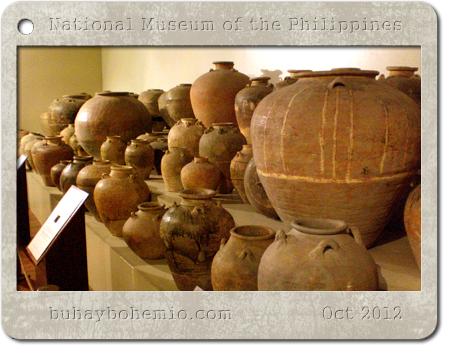 These earthenware jars were dated approximately 3 BC to 370 AD. 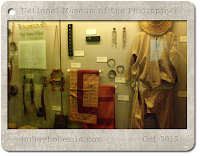 Ancient Filipinos had the custom of a second internment for their departed loved ones. After the body has completely decomposed, the bones are cleaned and then placed in jars such as this. The human figures on the lids are sculpted with childlike simplicity. Perhaps they represent the person whose bones they contain? But some jars contain bones of more than one individual. 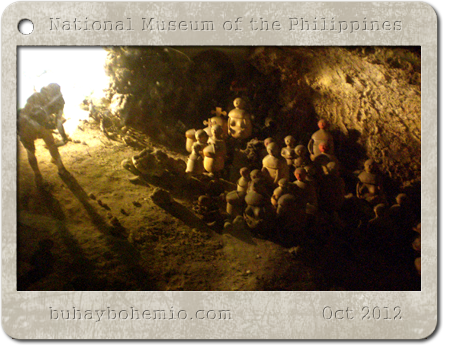 This is a diorama showing how the burial jars are placed when they were discovered in Ayub Cave. 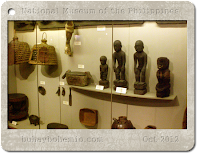 Another favorite gallery is the one that is about Philippine ethnology. 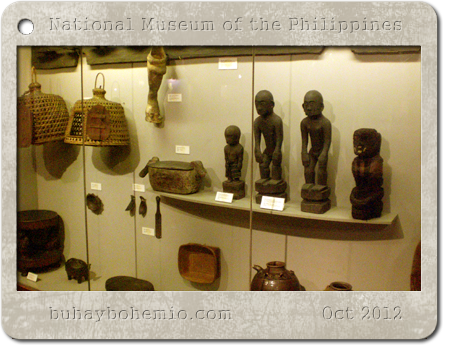 It is in this gallery you will see the diversity of our rich aesthetic culture before Western influence. These are traditional garments and ordinary household items of the Sama D'laut people (also known as Badjao). 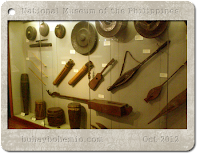 They are are an ethnic group from the province of Tawi-Tawi and they live most of their lives in boats. I love these musical instruments of the Maranao people. 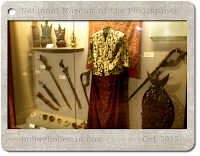 Traditional clothing, jewelry, swords and other items also from the Maranao people. 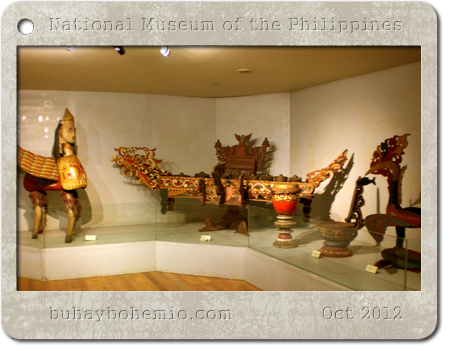 I'm beginning to have a fascination for the artistic culture of these people from Mindanao. I always have an appreciation for Igorot artifacts. I love the primitive charm of these people from the Cordillera region. 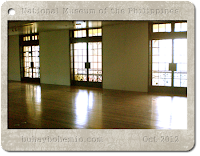 I was looking around inside the Old Finance Building and saw some large empty rooms like this one, with windows overlooking Luneta Park. I imagined having this room as my art studio. 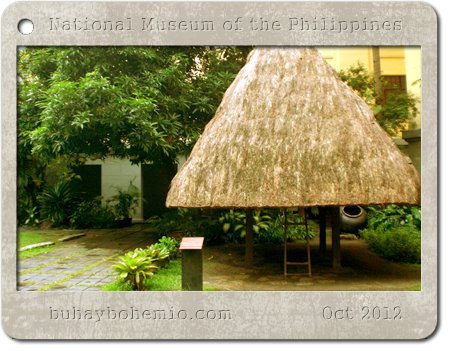 The Old Finance Building has an atrium where you'll find this lovely Ifugao house. It's authentic! I hope I get to visit Banaue someday soon. 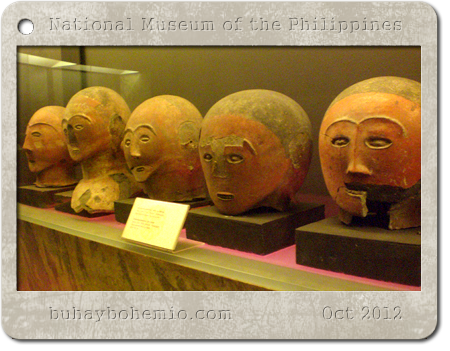 So this concludes my visit to our National Museum. 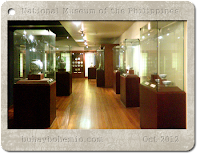 The museum is open Tuesday to Sunday, 10AM to 5PM. I hope you guys find time to give it a visit. 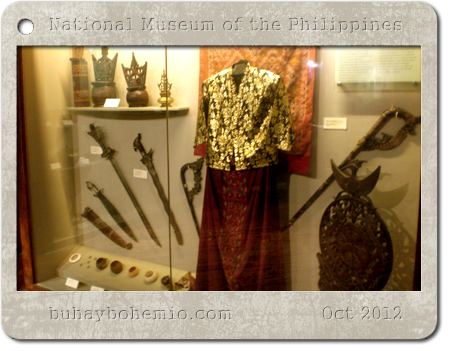 Seeing all the things here in person makes proud to be Filipino! 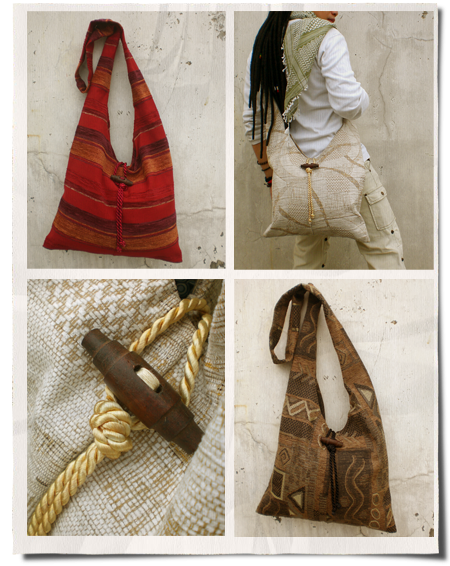 I finally completed making these monk bags and I'm selling them now on my online store. I only made 6 bags in 3 different colors. Making them was a easy, thanks to the old sewing machine here at home. 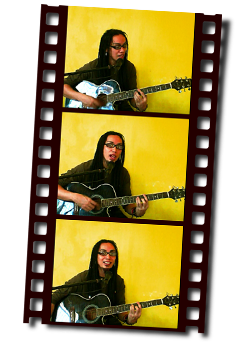 But it took long to complete because I have to put them aside sometimes to work on other projects. The fabrics I used are actually upholstery material so they're pretty thick. 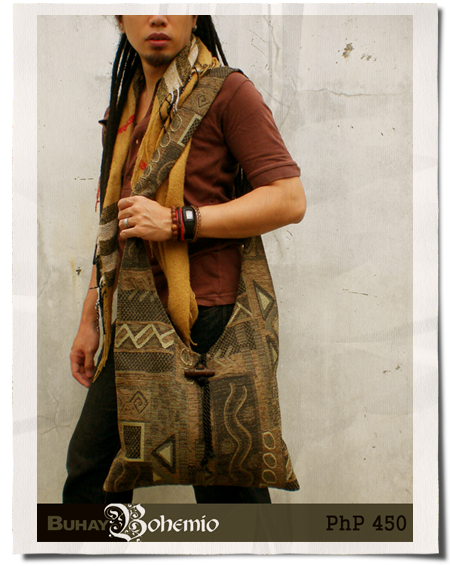 I selected patterns that has an ethnic feel, to compliment the shape of the bag. The patterns are woven and not printed and the texture really adds to the charm. I've hand-sewn the hems at the opening with invisible stitch. I'm selling them for PhP450 each. 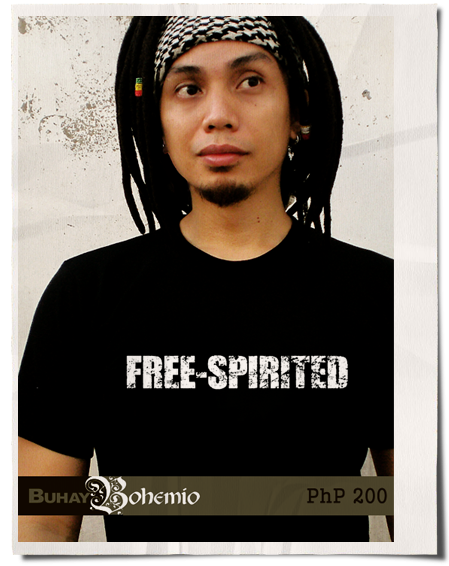 Actually I'm hoping for a more bohemian price - like PhP350. But the fabric alone is a bit pricey. Plus I added wood toggles and rope for the locks. I didn't put lining because that's gonna add to the price (and I don't know how to sew the lining just yet hehe). It's a good thing that the fabric is thick and firm enough by itself. Maybe on the next bags I'll put lining. And instead of a wood toggle and rope lock, I'll use a coconut shell button and a strap made of the same fabric. 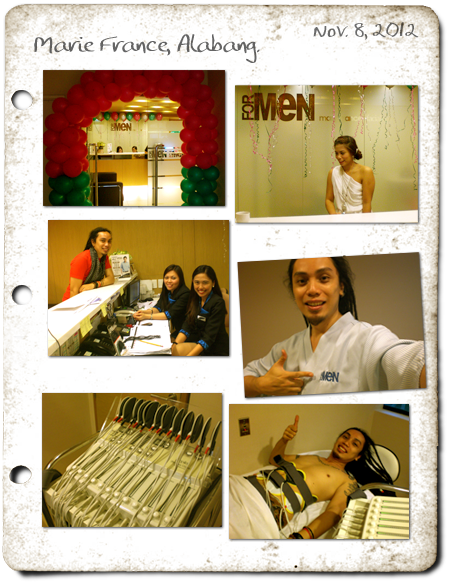 Marie France Bodyline is celebrating their 27th anniversary today and tomorrow, November 8-9, 2012, and I received an invitation to drop by the Alabang branch (in the Citibank-Frabelle Building along Alabang-Zapote Road) for cocktails and free treatment. Now that's how they keep in touch with their former clients. Yeah I had treatments back in 2010. I didn't always look this fabulous (modesty thrown aside LOL). Wanna see how fat I was? Click here. I was 190 lbs when I first stepped inside their clinic. 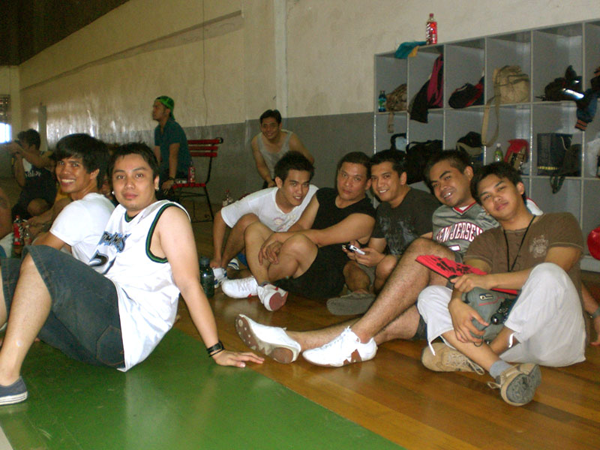 After their FMS (Fat Mobilization System) and Cold Wrap, I was 170 lbs. Now, after 2 years I weigh 160 lbs. ^_^ And the very friendly staff are glad to see that I was able to manage my weight even after 2 years. The complimentary treatment they gave me is the use of their Physique Inch-Loss machine. Fifteen minutes of this treatment is equivalent to 225 sit-ups! Electricity from the pads that are strapped on you causes your muscles to contract in a rhythmic pattern. I felt like I was belly dancing while lying in bed. The best time to avail of treatments from Marie France is during their anniversary because you get them under a buy-one-get-one promo. If your birthday falls under your treatment period you get additional sessions as well. I got treatments in March 2010 as a birthday gift to myself. Treatments from Marie France is quite pricey and you can be sure that they really work. I myself attest to their effective procedures. They are for the determined people who are serious about losing weight quickly. One can't really say that he's serious if he doesn't even watch what he eats or bother to do cardio exercise. Well I know that disciplining oneself could be a challenge - especially if we're talking about delicious food that is just within your reach. Really, one could easily forget about his obesity when there's a box of pizza before him. My friends and I watched this Disney CG-animated film yesterday. So it's a movie about life inside an arcade game. One would easily think that this movie is the kind that you'd watch just to get some laughs. But there's more to the movie than just funny scenes and cameo appearances from real video game characters. The story is actually very touching. 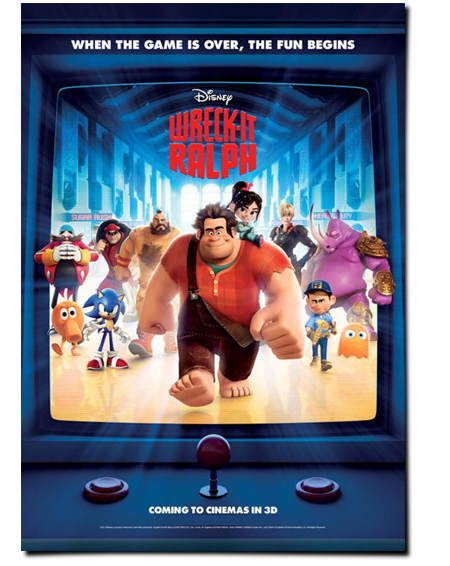 And who wouldn't love Ralph, the protagonist of the movie, who is actually the villain in his video game world? And it's cute that this big and tough guy whose job is to be bad and wreck stuff actually has a soft side and feels alone and unappreciated for what he does. Thinking that he'd be liked if he were the good guy, he leaves his video game and invades other arcade games to prove that he too can be a hero. 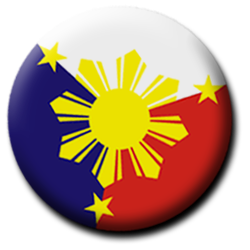 Happy Undas to my fellow Pinoys and Happy Halloween to the rest of the world. Today's the last day of the season of spooks here in the Philippines. So as a Day of the Departed special, I'm sharing this 2008 video by Weird US TV, a reality television series hosted by Mark Moran and Mark Sceurman, about their visit to the Mutter Museum in Philadelphia. The Mutter Museum is part of the College of Physicians of Philadelphia. It contains a collection of medical oddities, anatomical and pathological specimens, also wax models and antique medical equipment. 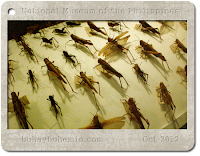 Though the original purpose of the collection is for medical research and education, one would think that this place is a museum of a lot of creepy stuff! 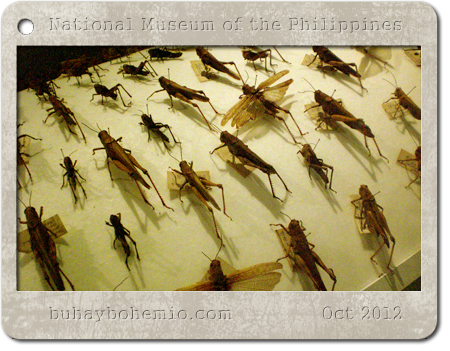 I wish I could get to see this museum in person someday.